A new post and again my favorite topic, no prize for guessing this...its Instant Jalebi! Yes one more sweet! Holi is around the corner and we all are busy with chores,kids,schools,work,home and what not! so when we have to make some sweet for Holi then why not make a Instant recipe? Yes, so I am sharing this crunchy and yummy and just like or even better than store bought one..Jalebi! No fermentation goes here but still so porous and crunchy. If some of you guessed I used Baking soda or Yeast then NO! I usually do not sleep with menu on my mind for next day,so when I wake up I usually take 5 mins to think what I am making today and then weighing all possible options I start my cooking. 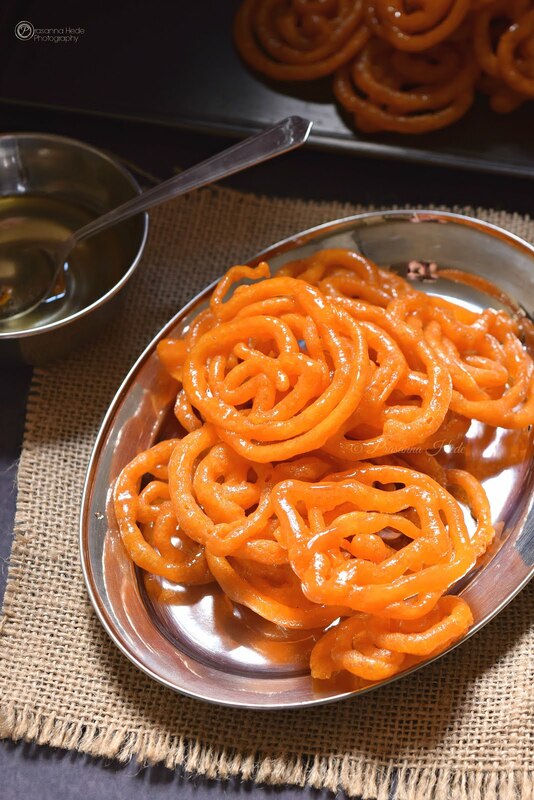 So today when I woke up I wanted to eat Jalebi,this is because two days back I saw a shinny box of Jalebi in the supermarket but did not dare to buy them as I had worst experiences before. Still you will wonder why not get ready to make Jalebi packs and make one? but then the feel of achievement you get from making something from scratch is different than store bought things. It hardly took me 5-7 mins to roughly assemble things and quick whip and to fry the jalebis may be roughly 10 Mins. I got them done so soon as I was doing multitasking. Before I could whip the mix ,I had already kept the sugar syrup to boil and ghee to heat. So by the time I could whip up the mix everything else was going on at its own pace. 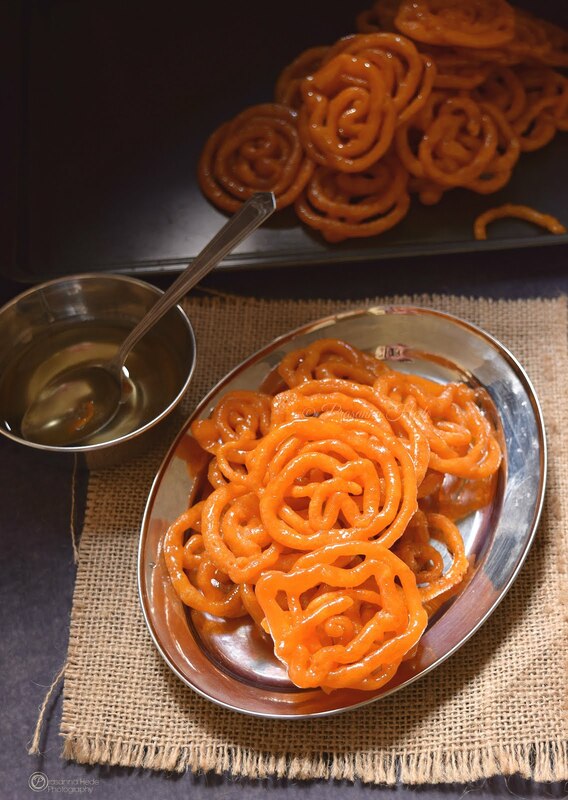 If making Jalebi was a nightmare then try this recipe,its very quick and easy. The final sugar syrup drunk jalebis were so yumm that they remained crunchy for almost 2 days now. I kept them in an airtight container. The glaze would fade away slightly after a day or two but the crunch wont. And the sugar syrup would be soaked inside so well that I did not even require them to soak for more than 2 mins. First,keep the sugar syrup to cook. In a sauce pan add sugar and water and let it cook on low to medium flame. Here I did not check a string consistency. I cooked it till it was thick. Mix well and keep it on lowest flame. When the sugar syrup cooks keep ghee/oil to heat in a deep frying pan to fry the Jalebi. Now,in a mixing bowl add all the ingredients for the batter except water and Eno Fruit salt. Now slowly add water little by little to for a soft batter. Make sure the batter should be of flowing consistency and not thick or gooey. When you drop the batter with ladle or spoon it should form ribbons. Now add Eno fruit salt. Mix gently. The batter will turn airy and light. Pour in sauce bottle or ziploc bag. When the ghee/oil is hot,slowly drop the jalebi in ghee/oil forming overlapping circles. Fry them on low to medium flame till crisp. After drianing them immediately drop them in hot syrup and let them sit for 2 mins. Then drain and arrange on plate. Do this for all Jalebis. The batter should be falling consistency. Frying the jalebi on low flame makes them crisp and reduces chances of getting burnt. The sugar syrup has to be hot/warm level so that syrup is soaked well in Jalebi. I don't have eno fruit salt. Will baking soda work? I have not tried with baking soda.You can try with a little portion of batter and see if it works. One of my favourite mithai,yours looks delicious and mouthwatering, thank you. I'll have to keep this in mind for my husband's birthday in a few weeks! 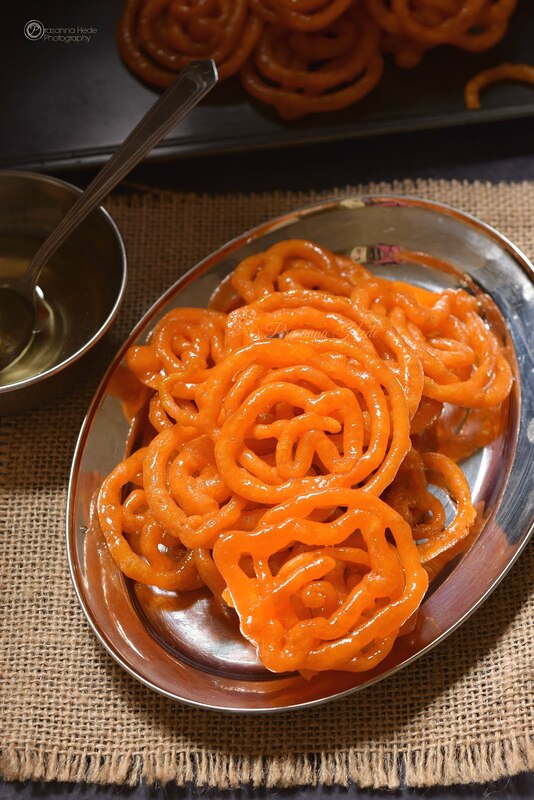 With instant jalebi you will have the sweet tooth making this more frequently. I have never heard of this before. It looks like fun, and the colour is awesome!! I've never heard of this either but they sound like a fun dish to make! These look beautiful! Never heard of fruit salt. I'm also wondering if a pinch of saffron steeped in the water would give a similarly nice color without using artificial food coloring? So interesting. I have never had the chance to try this recipe. But it looks so fun and colorful. I have never heard of fruit salt. What is it? What does it do for the recipe? As a kid we'd eat so much jalebi but I find it weird that my kids don't fancy it. Almost hurts me.. because I'd love to make these. ha!! This recipe looks so easy.